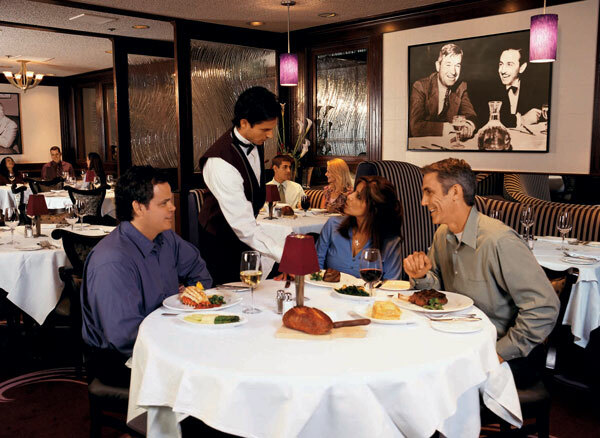 The Disneyland® Resort offers guests a number of dining experiences. Guests can choose from unique snacks, casual dining spots and even character or signature dining. Enjoy a grand view of the majestic Rivers of America at this delicious table-service restaurant serving classic American flavors with Cajun-Creole flair. Select from appetizing French Quarter favorites – including signature crepes and the irresistible Monte Cristo sandwich. Step back in time to a beautiful Victorian restaurant with ornate interior detailing, offering a grand setting for classic cafeteria dining. Enjoy delicious pastas, fried chicken, pot roast, salads, specialty desserts and a special Character Breakfast. Begin your morning at the Plaza Inn for “Minnie & Friends – Breakfast in the Park” Character Dining. It’s a great way to get charged up for the day with visits from Minnie Mouse and other beloved Disney Characters. The fixed-price buffet offers all your morning favorites including fresh-baked pastries, waffles and made-to-order omelets. Help yourself to all you care to eat while collecting autographs and taking great souvenir photos. Sink your fangs into savory skewers of beef, chicken, veggies and bacon-wrapped asparagus. Delectable desserts are also available to satisfy sweet-tooth cravings at this wild counter-service restaurant. This spotted snack stand in Mickey’s Toontown features kid-friendly items like the Kid’s Power Pack, a healthy yet tasty meal, and other Moo Plate Specials — in addition to the sweet frozen treats. Groove to the rollicking sounds of a jazz band on the Dixieland Stage as you enjoy a cafeteria-style meal — including sumptuous Cajun-Creole dishes like Cajun chicken salad, Creole salmon and seafood jambalaya. Chow down on chili fries, fish and chips and chicken breast tenders. Top off your meal with one of the show-stopping sundaes or other desserts. Dine on a rustic riverside patio — surrounded by the scenic wilderness — serving classic American favorites like cheeseburgers, chicken sandwiches, onion rings and salads. Hosted by Dixie. Step up and order ice cream cones, sundaes, Mickey Mouse Ice Cream Bars and a sweet variety of flavors and toppings. Hosted by Dreyer’s. Stop by this pup-ular quick service stand in Mickey’s Toontown for a premium hot dog or a children’s hot dog. Pluto’s Dog House serves juicy hot dogs with all your favorite fixings. Feed your galactic hunger with giant pizza slices, generously portioned pastas, crisp salads and more. This deep-space casual dining eatery features an open view of the kitchen. Enjoy hearty and healthful specialties for lunch and dinner including sandwiches, roast New York and turkey breast. Once Walt Disney’s cherished breakfast locale, this restaurant remains a favorite for classic breakfast fare including our famous Mickey Mouse pancakes. Rustle up hearty entrees like hand-dipped corn dogs, fish and chips and chicken breast tenders. Touch down at this intergalactic eatery that serves up an out-of-this-world menu. Favorite items include burgers, grilled chicken dishes like sandwiches and salads and more. Indulge your appetite with a royal feast served from a medieval pavilion-style tent. Your taste buds will sing with succulent bratwurst-seasoned pork sausage, baked potatoes and sweet corn on the cob. Step inside an alpine village and enjoy a meal here among the beautiful murals that illustrate the tale of Pinocchio and Geppetto. The menu features popular American cuisine like cheeseburgers and pizzas. Outdoor dining is set in a charming village scene. Hosted by Minute Maid. Children of all ages are thrilled to meet their favorite Disney Princesses up close! Bring your camera and capture the magic, framed by a beautiful mural of an underwater scene, while you collect autographs, greet Disney Princesses — including Snow White, Cinderella and Sleeping Beauty — and enjoy a most unforgettable time. Stroll along Paradise Pier and stop by the on-stage kitchens for ravioli, fresh Mediterranean salads or pizza with a robust array of toppings. Tuck into a hand-scooped ice cream in a waffle cone or a deliciously gooey sundae at this “udderly” adorable ice-cream shop that celebrates all things bovine! Dine on fresh, flavorful Mexican food from this counter-service restaurant. The menu reflects California’s rich heritage of integrating Californian and Mexican flavors, including chicken tacos, carne asada, tamales, burritos and nachos. This quick-service restaurant, inspired by the quirky “wigwam” motels along Route 66, offers fun, unique beverages, snacks and meals in each of the five different wigwam… or in the Cars Land interpretation… five different cones! Serves Starbucks® items including coffee and espresso beverages, Frappuccino® blended beverages, and signature breakfast sandwiches and pastries. Cruise on in to Flo’s V8 Café and fill up your tank on classic American cuisine with a new spin, including chicken tamales, French toast, fruit pies, Veggie-Tater Bake and home-style rotisserie classics such as pork loin, citrus turkey and New York strip loin! Discover the delicious good fortune of fresh made-to-order rice bowls at this Pacific Rim-inspired quick-service restaurant. Browse a health-conscious variety of healthy choices and fresh-baked bread from the world-famous Boudin Bakery. Enjoy scenic wharf-side seating as you dine on crisp salads and hot soups served in delectable bread bowls. Paradise Pier Ice Cream Co. Grab some yummy soft-serve ice cream at this convenient walk-up counter located under the neon ice cream cone. Grab a turkey club, roast beef and cheddar, grilled veggie or a grilled chicken breast Caesar salad to go. This Hollywood catering truck has a delectable selection of sandwiches, salads and snacks. Snack on popular bar appetizers like fried calamari, beef sliders, lobster nachos and artichoke dip while sipping on a cool sweet mixer or margarita. Select from a variety of icy, inventive margarita flavors and have yourself a fiesta. An old water tower from an abandoned fishing warehouse has been adapted to a much more festive function: a blended drink dispenser! The Spanish Colonia Revival-style restaurant is a warm setting to showcase contemporary Southern California cuisine – seasonal, artisanal ingredients; locally sourced produce, seafood and meats; hand-crafted cocktails, and California craft beers and wines. Diners at Carthay Circle Restaurant can also enjoy reserved center stage viewing at the World of Color nighttime spectacular. Dine on cuisine inspired by the South as renowned musical acts light up the stage for your entertainment. The menu features down home temptations like Voodoo Shrimp and Cajun-Creole seafood jambalaya, along with sizzling steaks, burgers and ribs. Gospel Brunch – Raise your spirits every Sunday at the inspiring, electrical and delicious Gospel Brunch! Sensational gospel choirs take to the stage while you dig into an amazing breakfast buffet, featuring home-style favorites like Alaskan snow crab, oysters on the half shell, biscuits and gravy, Southern fried chicken, custom omelets, herb-crusted roast beef and french toast sticks with all the fixin’s. Explore a tropical rainforest — complete with waterfalls, rain showers, live parrots, animated apes and all the sounds of a real jungle — at this unique dining adventure. Savor generous portions of food from around the world under a shimmering fiber-optic starscape. Indulge in a mixture of Mexican culinary traditions including taquitos, “drowned” nachos and Camarones Diablos with spicy shrimp and cracklings. Tortilla Jo’s also features live mariachis, an outdoor dining cantina, a hand-made tortilla station and happy hour every weekday! Signature hot sandwiches will be available including The Original 1762, a sandwich of freshly roasted beef, sharp cheddar and creamy horseradish sauce all on freshly baked artisan bread. Soups, salads, wraps and desserts also are on the menu. Earl of Sandwich offers a vast array of hot and cold beverages including The Earl’s Grey Lemonade. Breakfast sandwiches and pastries will be available in the morning and a variety of catering options will be offered at this location. Famous for healthy, refreshing and revitalizing smoothies, Jamba Juice offers an awesome array of tasty fruit combinations. Try the power-packed gourmet pretzels and breads for a quick snack or a healthy meal. Mouth-watering traditional Mexican dishes and magnificent margaritas make Tortilla Jo’s the perfect gathering place for fun and drinks. The outdoor taqueria lets you create your own custom-built tacos, nachos and burritos while sipping on house-made aguas frescas. With over 40 wines by the glass, a magnificent open air circular bar, tasty tapas and daily happy hours, Uva Bar is the ideal spot to have a drink and hang out. The hip metro-station architecture — inspired by the 1920’s Jazz Age — provides a unique atmosphere. Enjoy a glass of wine from the award-winning collection with exquisite seasonal creations for a fresh culinary experience that rivals fine-dining establishments anywhere in the world. Napa Rose was named the Most Popular Restaurant in the 2008 Zagat Survey for Orange County. Gather with good friends around the cozy fireplace in this lodge-like lounge and sip on a drink from the full bar. In the morning, enjoy a continental breakfast with fresh bakery goods, specialty coffees and a sweeping view. Indulge in an elegant dining experience with unparalleled service and a menu featuring an award-winning selection of prime steaks, chops and seafood. Savor certified Angus beef cuts and take advantage of a premium wine list. Breakfast is available. Escape to this unique, interactive lounge experience with a bit of Disney magic, adjacent to Tangaroa Terrace – Casual Island Dining. Set a course for this Jungle Cruise-inspired hideaway for tropical cocktails, juices and an ambrosial bar menu — fit for the gods! Get going with a variety of quick breakfast items including muffins, biscotti, bagels, yogurt and coffee. This convenient coffee shop is a great way to begin your day. Relax with a cocktail or glass of wine at this laidback lounge located adjacent to Disney’s PCH Grill in the lobby.